You need this beautiful strand of cultured pearls. This necklace needs to be in your jewellery collection. It's a win, win situation. You both get what you want. All you need to do is click on the "add to bag" button and viola . . . a match made in fashion heaven. 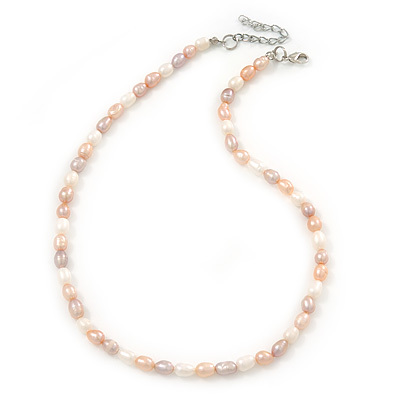 Featuring a single strand design, made of 5-6mm cream, white and pink rice shape freshwater pearls. The necklace has about 41cm L/ 5cm Ext. Fastens with a silver tone lobster claw clasp for a reliable fit.